If Adam had not sinned, he would have remained forever blessed, and all his descendants would have enjoyed blessedness. It was for this very purpose that God had created man. But Adam, having succumbed to the tempter-devil, transgressed against the law of the Maker and took pleasure in the taste of the forbidden fruit. When God appeared to Adam right after he had sinned, Adam, instead of repenting and promising obedience henceforth, began to justify himself and to blame his wife. Eve in turn blamed the serpent for everything. And so it was that sin became a part of human nature, deeply injuring it because of the lack of repentance of Adam and Eve. The existing communion with the Maker was cut and the blessedness lost. Having lost Paradise within himself, Adam became unworthy of the external Paradise and was therefore banished from it. […] No man, even the most talented and powerful, nor all of mankind in unison, could ever restore what Adam lost when he sinned in Eden. What would have happened to us and to all of mankind if Jesus Christ in His mercy had not come to redeem us? But we should all thank our Heavenly Father for taking pity on us. He loves us far more than we are capable of loving ourselves. And because of His infinite love, He has sent His only-begotten Son, our Lord Jesus Christ, to rid us from our sins and from the snare of the devil and to lead us into the eternal Kingdom of Heaven. Through His teachings Jesus Christ scattered the darkness of ignorance and all possible error and enlightened the world with the light of the true faith. Now anyone who desires it can come to know the will of God and attain eternal life. By His way of life Christ showed us how to live to attain salvation. And He also assists us constantly in everything good. By His most precious blood Jesus washed away our sins and made of us children of God, who were slaves of passions and the devil. Those torments we, as transgressors of the will of God, would have had to suffer, He bore for us. By His death He crushed the power of the devil, destroyed the power of hell, and delivered us from death. By His resurrection He gave us life and opened the gates of Paradise to all. Therefore, death is no longer an irreversible tragedy but a passage from this temporary world of vanity and sorrows to the world of bright and joyous life. By His ascension into heaven Christ glorified our nature, enabling us to share eternal bliss with the angels and all the heavenly creatures. 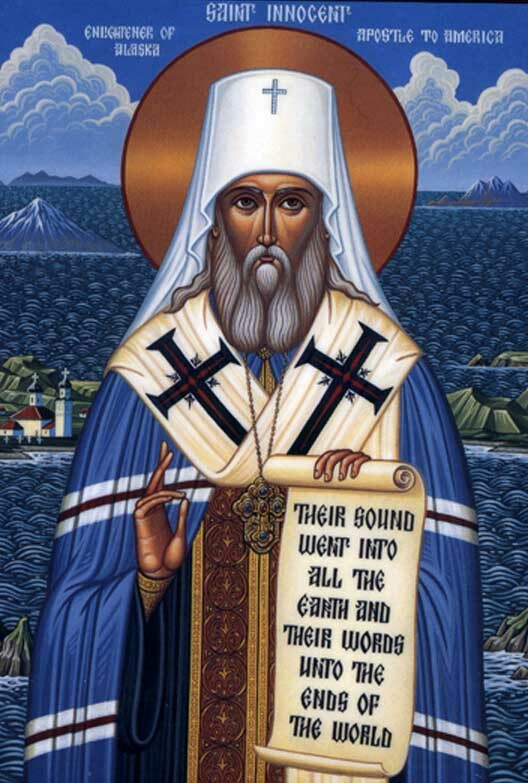 Innocent of Alaska (1797-1879; Russian Orthodox): The Way into the Kingdom of Heaven. We were created…with the high purpose to live with God—not for a hundred years or so—but for eternity! Every individual instinctively strives for happiness. This desire has been implanted in our nature by the Creator Himself, and therefore it is not sinful. But it is important to understand that in this temporary life it is impossible to find full happiness, because that comes from God and cannot be attained without Him. Only He, who is the ultimate Good and the source of all good, can quench our thirst for happiness. Material things can never wholly satisfy us. Indeed, we know from experience that every item we have desired has pleased us only for a short while. […] The most striking example of unquenchable thirst for happiness was Solomon, the famous King of Israel, who lived around 1000 B.C. […] He could easily satisfy any of his wishes, and it seemed that there was no pleasure that he did not possess or could not obtain. But with all of this, Solomon could not find total happiness to the end of his life. He described his many years of searching for happiness and his continual disappointments in the book of Ecclesiastes, which he began with the following phrase: Vanity of vanities, all is vanity (Ecc. 1:2). […] It seems that in the depth of our subconscious something reminds us that we are just wanderers on this earth and that our true happiness is not here but there, in that other and better world known as Paradise or the Heavenly Kingdom. Let man own the whole world and everything that is in it, yet all this will interest him for no more than a short period, while the immortal soul, thirsting for personal communication with God, will remain unsatisfied. Jesus Christ, the Son of God, came to this earth in order to return to us our lost capacity to spend eternity in the blissful presence of God. He revealed to people that all their evil lies in sin and that no one through their own efforts can overcome the evil within themselves and attain communion with God. Sin, ingrained in our nature since the fall, stands between us and God like a high wall. If the Son of God had not descended to us through His mercy for us, had not taken on our human nature, and had not by His death conquered sin, all mankind would have perished for ever! Now, thanks to Him, those who wish to cleanse themselves from evil can do so and return to God and obtain eternal bliss in the Kingdom of Heaven.